April 22, 2019  Here are some key things to know about Sunday's deadly attacks, the group that Sri Lanka blames for perpetrating them — and the country's complicated history. April 22, 2019  Weeks after Thailand voted for the first time since a 2014 military coup, the results are still not official. There are signs that the junta is set on clinging to power. April 22, 2019  Sri Lanka is blaming a Muslim militant group for the Easter attacks that left nearly 300 dead and wounded 500 others. The nation has a complex ethnic and religious tapestry and a history of conflict. April 22, 2019  NPR's Ari Shapiro speaks with Kris Thomas, a reporter for Roar Media, a digital news site in Sri Lanka, about the latest news concerning Sunday's terrorism attacks in the country. April 22, 2019  Sri Lankans mourned the deaths of more than 300 people who were caught in Easter Sunday's coordinated church and hotel bombings. 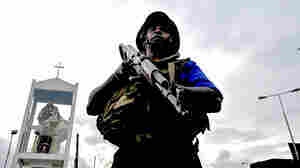 Officials blamed the National Thowfeek Jamaath, a local militant group. April 22, 2019  The puppy started following a team that was cleaning up the beach in Bangladesh. And now he is an Instagram star. April 22, 2019  The series of blasts were set off on Easter Sunday — flaming political and social tensions. Rachel Martin talks to Jeffrey Feltman, former under-secretary-general for Political Affairs at the U.N.
April 22, 2019  As India's economy has opened and grown robustly, so has Hindu pride. A lifetime after India cast off colonial rule, it's embracing a new identity and its majority Hindu faith is playing a big part. April 22, 2019  A curfew has been lifted, the day after a series of explosions hit churches and hotels. David Greene talks to freelance journalist Lisa Fuller in the Sri Lankan capital Colombo. 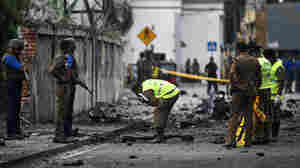 April 21, 2019  NPR's Sacha Pfeiffer speaks with Alaina Teplitz, United States Ambassador to Sri Lanka and Maldives, to better understand the attacks that took place in Sri Lanka. April 21, 2019  More than 200 people were killed in a series of attacks on Sri Lankan churches and hotels on Sunday.